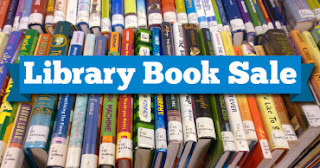 We are having a BIG BOOK SALE of withdrawn stock on Saturday 16th June, 10am - 1pm in Longniddry Community Centre. This is a great opportunity to grab a bargain - perfect for going on your summer holidays! And if you finish the book when on your hols, then you could leave it for someone else to discover, giving you more room in the luggage bags for all the treasures bought on sightseeing trips! We will be selling fiction, non-fiction, children's books, audiobooks (tapes & CD) and DVDs!